Coaxial (joy-stick) rests allow both vertical and horizontal movement with a single control. If you want to make a diagonal shift in point of aim, you can do this with one, smooth, continuous movement. Until now, this advantage has been limited to front rests. 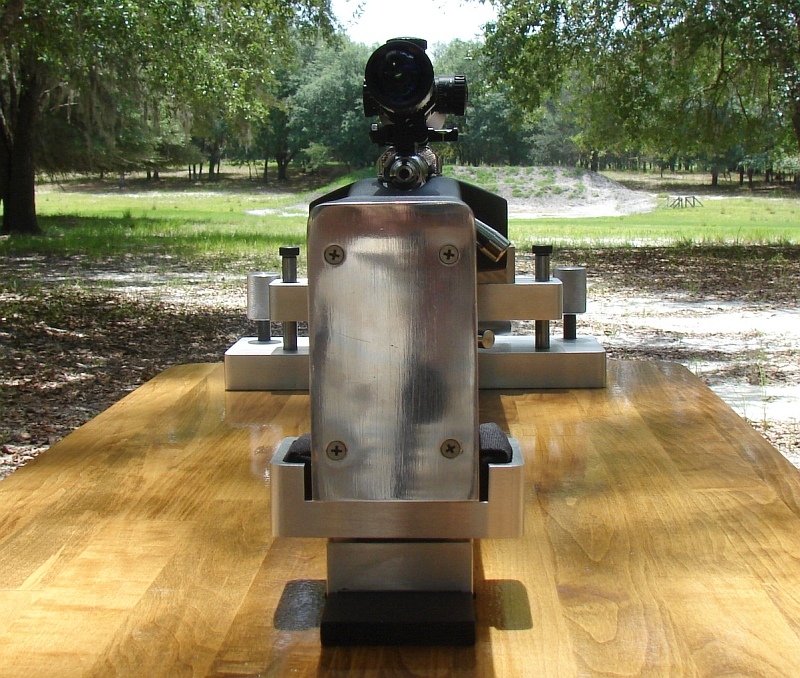 Well there’s some new technology in the benchrest world. Forum member ‘Straightpipes’ has created a coaxial rear joystick rest. He built this simple, compact rear rest in his home workshop for use with his 40-lb Heavy Gun. 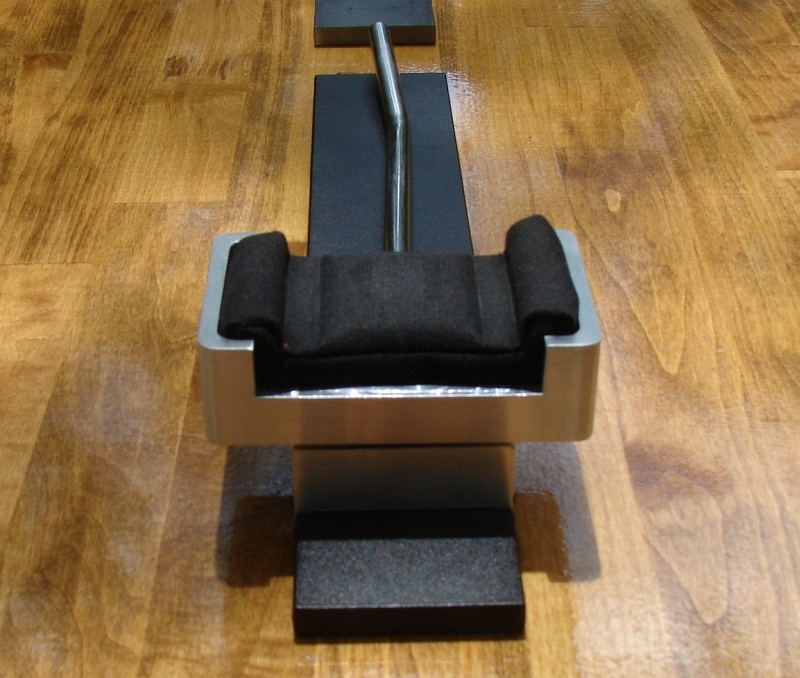 In combination with a vertically adjustable front rest, this new rear joystick rest allows aiming to be controlled from the rear, with your left hand in a comfortable position. The rear rest is crafted from aluminum with a stainless steel forward-pointing joystick. Total weight, including the long, stabilizing base foot, is about 10 pounds. Though the rear rest doesn’t seem to have a large movement range, the system offers plenty of “on-target” travel. At 100 yards, the rest offers 10 MOA left, 10 MOA right, 5 MOA up, and 5 MOA down adjustment. That’s plenty of range for most targets, once you center the Point of Aim vertically using the captain’s wheel on the front rest, which Straightpipes also crafted himself. Click Square Photos Below to see Large Images. Inside the rear cradle sits a Protektor rear sandbag, with Cordura fabric filled with ordinary sand. This fits the 3″-wide bottom of Straightpipes’ 40-lb heavy gun. There are some sophisticated components you can’t see in the photos. The rear rest can pivot (right or left slightly) to stay aligned with the front rest (as adjusted to level the cant of the rifle). Straightpipes says: “With the pivot, whatever I do to the front, the rear follows.” The basket (cradle) also employs a 20-lb bias spring system to handle the weight of the Heavy Gun. This prevents the co-axial system from binding, so it is fluid and easy to operate. Even with 20 pounds of gun weight on the rear, the joystick can be easily manipulated with a light touch of thumb and fore-finger. Watch the video below to see how the joystick controls the rear rest. Total joystick movement is about a 2.5″ sweep. This gives 20 MOA total windage adjustment at 100 yards, and about 10 MOA vertical. 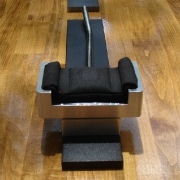 The coaxial rear rest is designed to work with the massive front rest as a system, though they are NOT connected, so as to comply with IBS Heavy Gun rules. 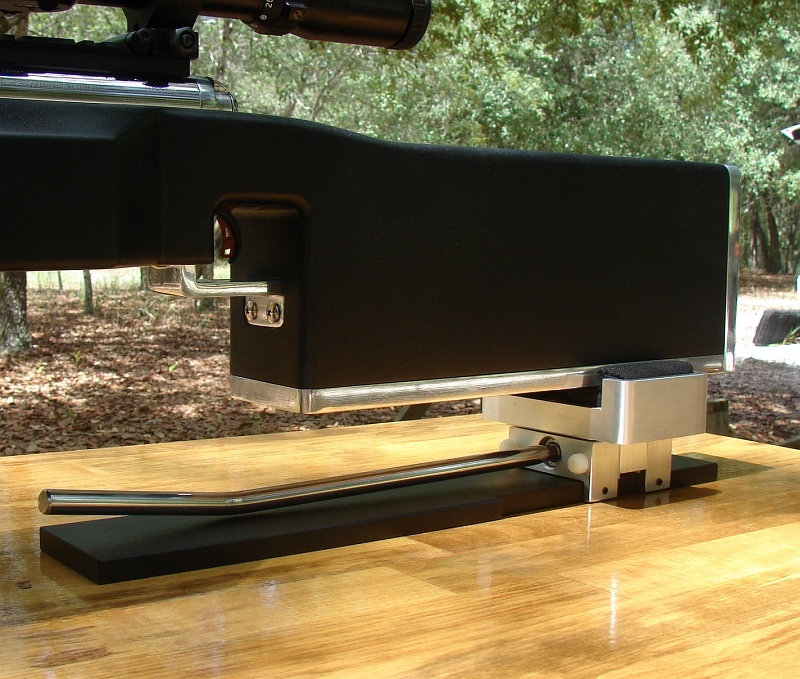 The 30-lb front rest supports exactly half the weight of the rifle and is used to set gross elevation. Windage and fine elevation is controlled in the rear. Straightpipes also designed and built his beefy front rest himself. As with his rear coaxial unit, the front rest pieces were all shaped by hand on a belt sander after being milled out. Straitpipes even “finish-sculpted some pieces with hand files the old craftsmen way.” The main center support column was milled with extremely fine threads. This allows the captain’s wheel to turn with little effort and no locking mechanism is required. Straightpipes does not need to fuss with locking knobs when he sets gross elevation. To help keep the unit from binding, there are stainless guide shafts on the left and right. These shafts slide in oil-impregnated bronze bushings. Straightpipes built this beautiful set of rests to work with his 40-lb Heavy Gun. Chambered in 7mm WSM, the gun features a Savage Target Action, and a Brux 32″, 1.300″ straight-diameter barrel fitted with a custom barrel nut. 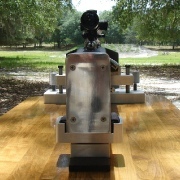 The barrel is clamped forward of the action in a 9″-long barrel block. This allows the Savage action to free-float. The block, also built by Straightpipes, looks fairly standard, but it has some clever design features. Between the barrel and the block there is sleeve that is slightly compressed when the block’s bolts are tensioned. This sleeve, made of a proprietary material, eliminates metal to metal contact between barrel and block. Straightpipes believes this enhances accuracy and provides some damping. Other shooters with barrel-block guns have used epoxy between block and barrel, but that makes disassembly difficult. The sleeve system on Straightpipes’ gun allows the barreled action to be easily removed from the stock. In addition, the compressed sleeve system is very stable — Straightpipes doesn’t have to fiddle with the bolt torques on his block. Is it accurate? In a word, “Yes”. Straightpipes doesn’t want to make claims before the rig has been tested in competition, but he says it has “shot groups at 600 and 1000 yards that would be very competitive.” We promised not to publish group sizes yet, but we can tell you that at 600 yards in good conditions it drilled some “scary small” 5-shot groups, well, well under 1/4 MOA. 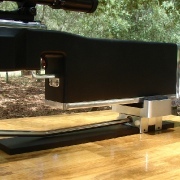 Share the post "Coaxial Rear Rest on Heavy Gun Benchrest Rig by ‘Straightpipes’"
Forum member George (aka gcarbrera) let us know that complete Shooting Sports schedules for the 2012 London Olympic Games can now be viewed online. Olympic shooting events start on July 28, 2012 with Women’s 10m Air Rifle and Men’s 10m Air Pistol. The final rifle event, Men’s 50m 3-Position Finals, will be held August 6, 2012. LINK: Complete Olympics Shooting Schedule with links. Share the post "Olympic Shooting Sports Schedules — Mark Your Calendars"